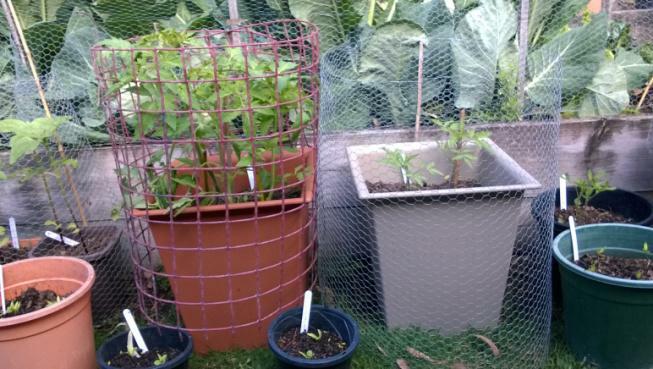 Biochar user Keith Laker has relayed this story for me to share with the world. Thank you Keith. I first became aware of Biochar through the book “The Biochar Revolution” advertised in the Diggers’ Club website whilst browsing for vegetable seeds to buy. 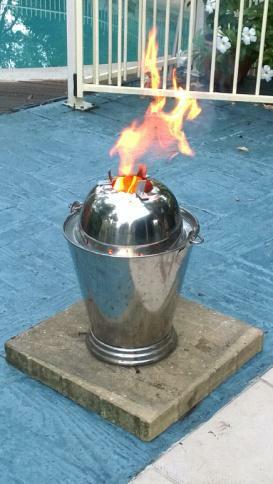 You can make your own biochar using a home made TLUD (Top lit up draught stove). I made mine from a design in the book and from watching Youtube videos of other people’s efforts. This Youtube link shows a stove made from materials very similar to my own. TLUD stoves burn waste wood from the top down rather than the bottom up. At the end of the burn process the wood is carbonized but retains its shape. 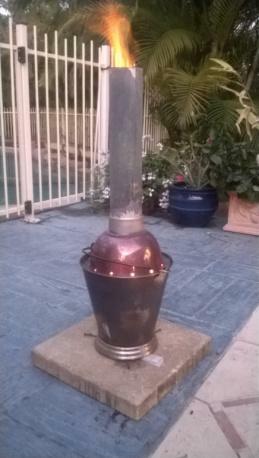 My TLUD stove is made from a stainless steel bucket, an upturned stainless steel bowl, a ducting connector and a short length of galvanized pipe for the flue. Holes have been drilled under the bucket to let in limited air when the stove is first lit. The main air source is from the holes drilled around the rim of the upturned bowl. During the burn process the bucket is fractionally raised off the ground by sitting it on three long nails so a little air can enter through the holes in the bottom. To light the fire from the top I spread a small amount of citronella lamp oil on the top layer of material and then drop a lit piece of paper, again dipped in lamp oil, down the flue. The fire burns brightly with virtually no smoke. TLUD stoves can be used as cookers and for heating water in many developing countries. The skill, gained from a bit of trial and error, is knowing when the wood has burned enough to carbonize but not too much so it turns to ash. I use a folded bit of paper inserted under the stove next to the nails. When it starts to scorch I know the heat has reached the bottom of the bucket and the burn process has to be stopped. The three nails elevating the base of the bucket are removed to stop air coming in from underneath. 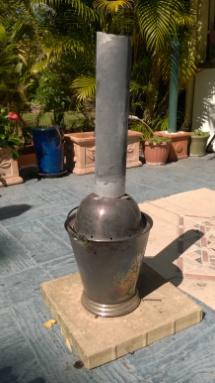 The flue and bowl are removed and the fire rapidly begins to die down. I smother the fire by using the heavy lid of my cast iron Cheminea outdoor fireplace which conveniently fits the top of the bucket, and leave it overnight to cool. You can also douse the fire with water to end the burn process. 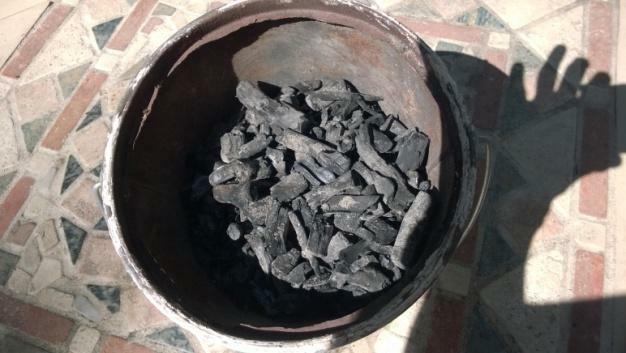 The result is carbonized wood ready for inoculation by the biochar user. The charcoal has a very fine and porous structure which powerfully attracts and holds beneficial soil microbes and water. This can mean that when initially applied, it can draw in microbes from the soil. For this reason many biochar makers believe it is better to “ inoculate” the biochar with nutrients such as compost tea, worm juice, Seasol and other organic fertilizers and let it “brew” for about three weeks before adding to the soil. The recommendation is four parts compost to one part biochar. My compost is primarily grass cuttings and green waste made in a tumbler. I also add worm juice and castings. Everyone develops their own recipe. The mixture is then left to charge for three weeks before use. 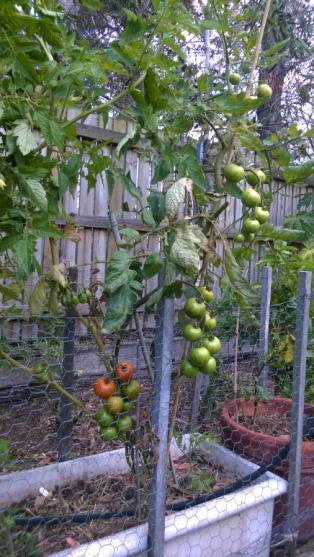 In fact we have never had better tomatoes than we had this year, all either planted with inoculated biochar or have had biochar added later. We planted heirloom Periforme Abruzzese and Tigerellas. They have fruited phenomenally. Likewise our broccoli, cauliflower, beans and silverbeet. 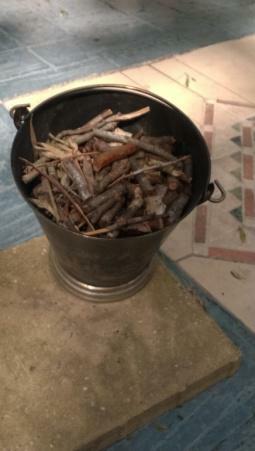 Next post: Biochar Training, full immersion weekend 29th Nov.